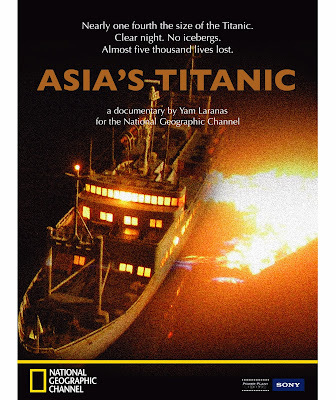 National Geographic Channels International (NGCI) has announced the premiere of “Asia’s Titanic,” a one-hour National Geographic Channel exclusive that probes into the world’s worst peacetime maritime disaster ever recorded. This is the first documentary produced by NGCI in collaboration with a Filipino film production group under the NGCI-EDB (Economic Development Board) development fund grant. 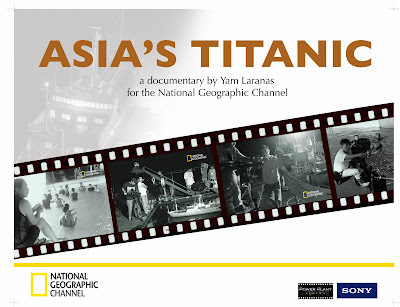 “Asia’s Titanic” will premiere exclusively on NGC (Sky Cable Channel 41) on August 25, 2009, Tuesday, at 9 p.m. It will replay on August 26 at 4 am, 9 am, and 1 pm; August 30 at 9 pm; and August 31 at 1 am and 5 am. “The documentary is a milestone for Filipino filmmakers to celebrate the launch of an exceptionally high quality movie to Filipino and global audiences with a strong admonition about sea safety,” said Jude Turcuato, NGC Philippines territory director. “We are deeply committed to support the Filipino filmmaking industry with the unique opportunity of showcasing its creative talents to NGC viewers worldwide. The documentary is a powerful and dramatic story made by a Filipino production team that equals the hallmark standards of National Geographic,” Turcuato said. “Asia's Titanic” presents the tragic sinking of MV Doña Paz after colliding with an oil tanker off Mindoro Island just five days before Christmas in 1987 — about 4,000 passengers died in the tragedy. The disaster is told through dramatic first-hand accounts of survivors and rescuers, actual transcripts from the Philippine congressional inquiry into the tragedy, archival footage and photos, and a re-enactment of the collision. The documentary is directed by award-winning director Yam Laranas. It is the first for any Filipino filmmaker to direct a full-length documentary for National Geographic. Laranas said making the documentary was exciting. At the same time, he said it was heartbreaking to hear first-hand the horrifying accounts of the few survivors. He said the survivors themselves broke into tears while reliving their tragic ordeal. In making “Asia’s Titanic”, Laranas and his team were guided by NGC’s supervising producers to meet the high standards of the channel’s documentary filmmaking—compelling storytelling, breathtaking and engaging visuals, and clear and crisp sound. First Pinoy documentary on NGC. Award-winning Filipino director Yam Laranas gives specific directions to his cameraman during the filming of a scaled replica of MV Doña Paz for the National Geographic Channel’s (NGC) documentary “Asia’s Titanic.” This is the first documentary produced by National Geographic Channel in collaboration with a Philippine film production under the NGCI-EDB Development Fund. “Asia’s Titanic,” which tells of the tragic sinking of MV Doña Paz just few days before Christmas of 1987, will premiere on NGC (Sky Cable Channel 41) on 25 August 2009, Tuesday, at 9 p.m.
National Geographic Channels International (NGCI) invites viewers to re-think the way they see television - and the world - with smart, innovative programming. A business enterprise owned by National Geographic Television (NGT) and FOX Entertainment Group, NGCI contributes to the National Geographic Society's commitment to exploration, conservation and education through its six channels: National Geographic Channel, National Geographic Channel HD, Nat Geo Wild, Nat Geo Wild HD, Nat Geo Adventure and Nat Geo Music. Globally, National Geographic Channel (including NGC U.S. which is a joint venture of NGT and Fox Cable Networks Group) is available in 305 million homes in 165 countries and 34 languages. three cheers to us all! Yes, it's our country's pride for this awesome docu masterpiece! Thanks for leaving a comment.